This is our second big week focusing on colorectual cancer. Three weeks makes a streak. We’ll see. Our paper is Mapping Vitamin D Deficiency, Breast Cancer, and Colorectal Cancer by Sharif Mohr, including four authors whose surnames suspiciously begin with G.
Paper is making the rounds with people concerned that they ought to be popping Vitamin D (VD for short?) pills to stave off the big C (today’s post sponsored by the letters C, D, G, and V). Idea is that there’s more sun the closer to the equator you get, therefore the more opportunity there is for your body to produce VD. Why is this important? Because statistics appear to show that people who live in equatorial lands have lower rates of breast and colorectal cancer. 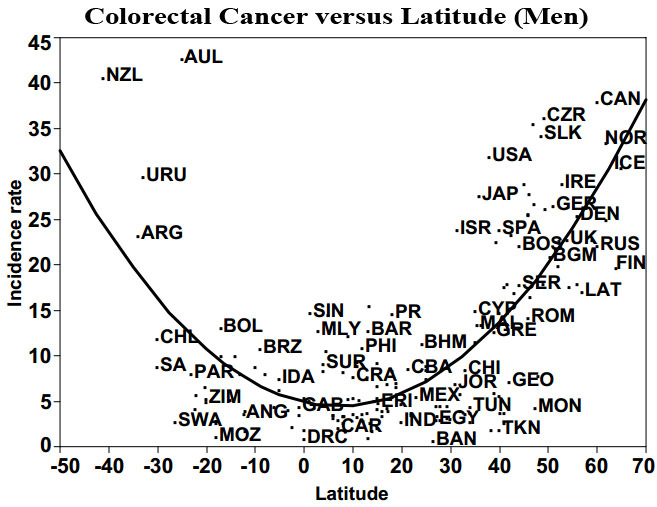 Rates of colorectual cancer countries classed by latitude. This picture from their paper gives you the idea. Shows the rates of colorectal cancer (found in various and variable public data sources) by about 200 different countries classed by latitude (not all countries are labeled). Paper has a similar picture for breast cancer. Seems plausible that the further from the sun you get the more at risk you are of cancer, no? No. Those equatorial countries are places like the Democratic (don’t laugh) Republic of Congo, life expectancy 45; Equatorial Guinea, life expectancy 48, and so on and such forth (data source; from 2000). This is versus sunlight depraved countries like Finland, life expectancy 78; Denmark, life expectancy 78; and on and on. Now the longer you live the higher the chance you’ll develop one of these “old age” cancers (you have to die of something, after all). Most people are diagnosed north of 50. So if you die before 50, you don’t have much chance of getting these cancers. This is my “theory”, which has the benefit of parsimoniously explaining the observed data. This explanation was much too simple for Mohr and the Four Gs, who show no sign of having thought of it. They instead developed complicated regression models of solar irradiance, optical depth, population density and, oh, I don’t know what all else. They got the wee p-values they sought, which was all the proof they needed. Thanks to Mark McLain â€(@macmark9) for alerting me to this article. I have always said that living too long will give you cancer! “Sunlight depraved”. That’s a thoughtful typo. Briggs, they claim to have adjusted for age which means that they have thought of it. Are you saying that they have done it wrong? But I thought too much exposure to the sun caused skin cancer. Does this mean I have to choose between colorecatal or skin cancer? All those unknown residual confounders! For those who are vegetarians, or anyone who eats plant matter on a regular basis, there is little to no need for photo-production of Vit. D3 (from 7-dihydrocholesterol) in the skin. That is because plants and fungi utilize photo-production Vit. D2 (from ergosterol), which is readily converted sans sunlight to vit. D3 in mammalian livers once ingested and absorbed. In fact the ingested form of Vit D is sufficient to activate Vit D degradation enzymes in the liver due to excess Vit D3. So why would these authors claim only human exposure to sunlight is the issue? Previous Previous post: Tea Partiers Know As Much Science As Enlightened Lefties?